Brunch 11:30 AM - 2:30 PM - FREE! Ukuleles are small. 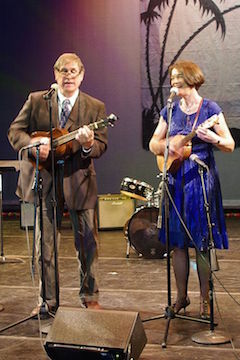 Yet, ukulele duet Greg Doyle and Wendy Matthews —The Edukated Fleas— play the big hits, favoring swing and vintage tunes – as well as a few things you might not expect to hear on uke. The Fleas have been playing together as a ukulele duo since late 2006, united by a common love of the music from the '20s through the '50s. As the Fleas soon discovered, ukes are perfect for these cheerful, melodic tunes. The Fleas feature both Greg and Wendy on vocals, often in harmony.